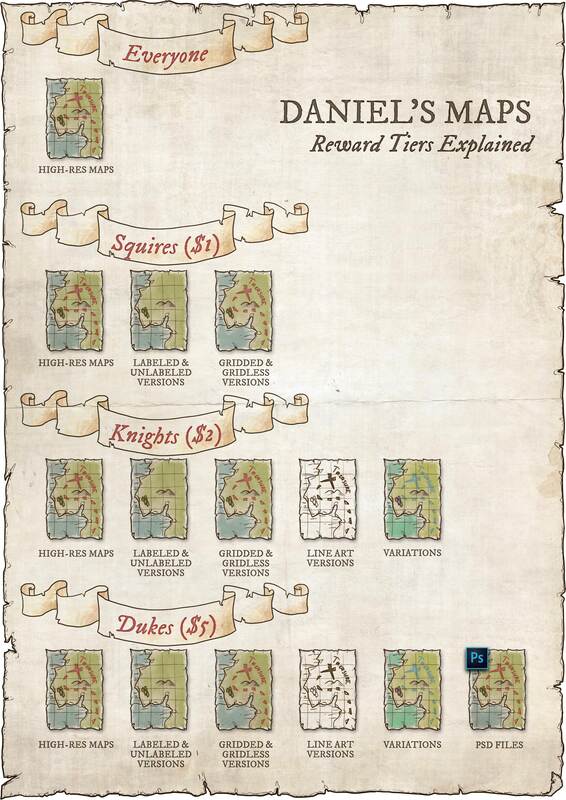 Hi, I'm Daniel from Daniel's Maps, a map artist from the Netherlands. I love to create high-quality RPG content for DM's and players. Among the work that I put out are world- and regional maps, city- and town maps, dungeon- and battlemaps and even the odd illustration or two. My primary goal is to create content that is system-agnostic and available to everyone. I'll draw maps based on a theme that is decided by my supporters. Each theme will consist of at least one larger area map (eg. an island, forest or kingdom) and various smaller scale maps focussing on specific areas (eg. A city or town, a town square, forest road, or dungeon). The amount of maps per theme depends on how interesting it is to my supporters. We might decide to move on to the next theme after 4 or 5 maps, or maybe we'll flesh it out more before we move on. The next theme will again be decided by a poll among my supporters! Besides that, I'm always eager to hear your thoughts and suggestions so that I can continue to tweak my content to fit your needs! The awesome thing is; all the content that I create is 100% free to everyone. That means that you don't have to support me on Patreon to get access to the work that I put out. Feel free to use my maps for personal use. If you can spare some, I appreciate your support. If not, no problem! As I said, all the content I create is free, so what's in it for you? Besides the main content I also offer rewards for my supporters based pledge levels. These rewards vary from alternate versions of the map, to having a custom map made! Find out more about that on the right side of this page or check it out below. If you support me I can only say; thank you so much, it means to world to me! If you have questions, comments, or suggestions, you can contact me at [email protected], or join the Daniel's Maps Discord server! A squire's life is full of adventure. And for adventures you need maps! A vote in my Patron-only polls to decide which content will be made next! Being a knight is a true honour, and with plenty reward too. A Duke is a powerful individual, and you need to be able to shape your domain to your liking. Organised and layered PSD files of the maps. When we reach this goal, I'm going to set up a World Anvil page for each of the themes that we do! Each theme region will have a detailed background and each town, building and dungeon will have its own page, as well as any features directly related to those!